Today I am thankful for ramen and chow mein noodles. I know that probably sounds strange. 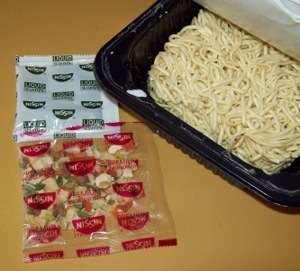 After all, ramen and chow mein noodles are not exactly considered to be a delicacy, at least not here. But they are not without their benefits. Certainly, they are not exactly nutritious nor healthy by any stretch of the imagination, and the little packets of “seasonings” that come with them are generally questionable little packets that if anything are loaded with sodium and all manner of other unhealthy ingredients. Yet, to me, they are something more. They are a reminder of what it was like when I was a student in undergrad living on a tight budget, when money needed to stretch as far as it possibly could, and ramen and chow mein noodles cost about a dollar each and were quick meals that traveled well. I learned then that, though they were not fancy, they were “good eats”, as some might say, when the pickings were slim.